The answers are varied, but with consistent themes. Many respondents cited gold’s usefulness in a crisis: gold can be activated in an emergency; gold is an emergency reserve in a crisis; gold is a contingency against unforeseen events; gold is a form of insurance; or, as the Bank of England said, gold is ‘a war chest’ and the ‘ultimate asset to hold in an emergency.’ Nearly all central banks referred to gold as a safe-haven asset. Many central banks mentioned gold’s high liquidity, and some referred to the ability to use their gold to raise liquidity in a foreign currency, even for foreign-exchange intervention. Gold’s role as an inflation hedge was cited in a number of answers. 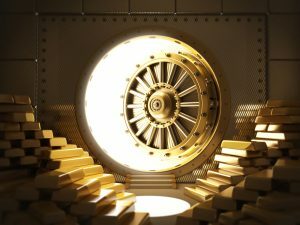 Many of the banks also said that because of its unique attributes, gold does not have any counterparty risk or credit risk, and because it is not issued by governments, it has no default risk. The return-generating potential of gold via lending was also cited. This highlights the secrecy surrounding all data relating to the gold lending market, which is based in London, Berne and Paris. Many of the respondents also highlighted gold’s portfolio diversification benefits. Because its price is not affected by economic events in the same way as the prices of financial securities, the gold price is not highly correlated with the prices of other assets. Gold therefore brings stability to a reserve asset portfolio. With such widespread support among the world’s central banks for holding physical gold as a safe haven, as an inflation hedge, and as a form of investment diversification, their enthusiasm for gold in 2018 looks as strong as it has ever been in any decade of the modern era. Could Stars Be Aligned for $1,500 Gold?